Chairs around the home or office are quintessential as they provide comfort and relaxation to you along with their aesthetic appeal. There are numerous types of chairs available and every chair has a different use. They provide utmost comfort to sit and read, to take a nap or to work on a laptop. 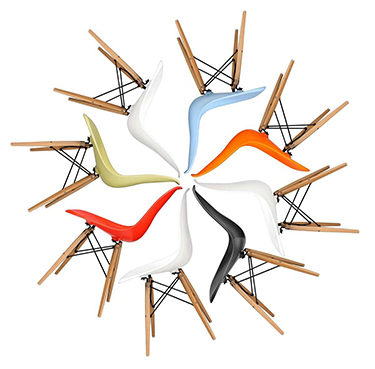 You can choose from rocking chairs, wing chairs, metal ones, folding chairs or stacking chairs etc. Lounge chairs complete your living room with their comfy and cozy quality that is inviting after a long tiring day. You can choose the upholstery from solid, floral, checks or stripes and liven up any space with this essential piece of furniture. While rocking chairs add panache to your interiors, wing chairs are the most comfortable pieces to sink into after work. Add elegance to your bedroom, living room or balcony with unique lounge chairs that can make any setting look vibrant and inviting. You can choose from different colors, designs and prints that suit your décor and enhance the charm of your space.